You previously revealed that the inspiration for your Avalon series came in a dream. 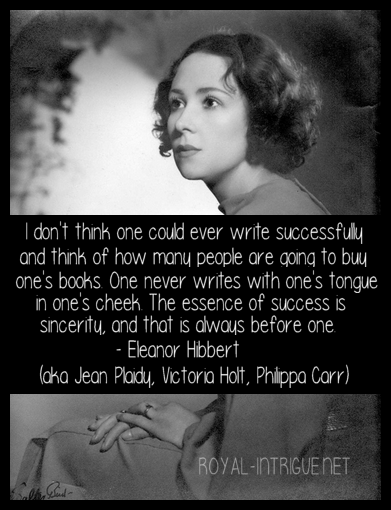 Have you always had an inclination for writing or is it a newfound passion? Oh, yes, I’ve been writing stories all my life, though only seriously pursuing novel writing since college. 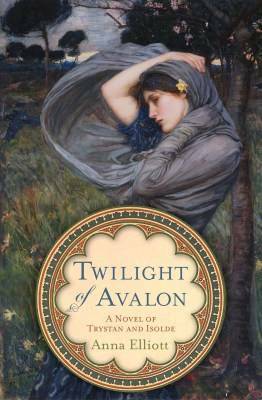 I’d written several books, but had almost given up on seeing any of them published when I had the dream that inspired me to write Twilight of Avalon. Other than Arthurian legends, what historical topics or eras intrigue you? Gosh, I almost can’t think of any historical eras that don’t intrigue me! I just history, love learning about the details of daily life in past eras and cultures. I’m especially fascinated my Ancient Egypt and the Victorian era, if I had to pick just two besides Celtic Britain. How do you handle the challenges of raising young children and writing? Well, really in answer to that question what I should do first of all is hold up a photo of my husband. He’s a one hundred percent full partner in parenting our two girls (ages 4 and 15 months), and there’s really just no way I could write the books I do without his constant help and support. I have practical day to day strategies worked out, too, of course. I keep myself pretty strictly on track with a set daily word count goal, I get up early, I multi-task, etc. But I think my real, over-arching answer to ‘how can you find the time?’ is twofold: First of all, my girls need a mama who’s happy and relaxed and fulfilled, and writing helps me to be all those things. So how can I not find the time to write, when it helps so much in letting me be the kind of mama they deserve? And secondly, I’m raising two girls, who will in all likelihood one day be juggling the demands of motherhood with whatever career they are passionate about. I need to set them a good example, to let them know that you can be done. Have you experienced any backlash regarding your blend of historical truth and fiction? It’s a very interesting spectrum of what readers need and expect from historical fiction. I personally would label my books ‘historical fantasy’ rather than straight historical fictions, which means they are a blending of truth and legend, as you say. I do find some readers who object: There wasn’t really a castle at Tintagel in the 6th century! But I try to be clear and honest in my author’s notes at the back of the books and on my website about where and why I’ve deviated from straight historical truth. My own feeling is that since I’m working within the tradition of Arthurian legend–which is in itself a fictional, fantasy world–it’s important to honor the legends as much as the straight history. 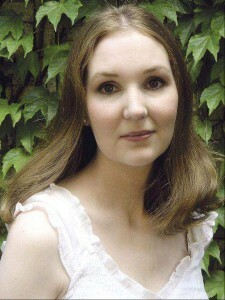 How closely does your Isolde match with the traditional Iseult from Joseph Bedier’s romance? In terms of personality/character, I think I stayed fairly true to legend. The traditional Iseult is a highly skilled healer, just as my Isolde is, and a very strong and passionate woman in her own right. I did deviate from legend in terms of the parentage I gave my Isolde. I made her the daughter of Modred, Arthur’s illegitimate son, and Gwenevere, which is purely my own invention. Your first two novels have skimmed the surface of the romance between Trystan and Isolde. 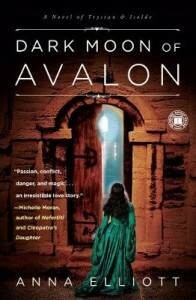 What does the third have in store for your Avalon fans? 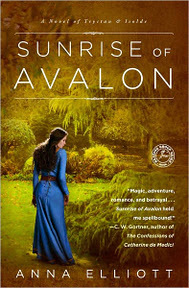 I finished writing Book 3 (Sunrise of Avalon) this past year, but actually the very last scene of Sunrise was the first thing I wrote, before I even started work on Book 1. It was wonderful to actually get there, to finally get Trystan and Isolde to the ending I’d been working towards for them all along. In terms of what to expect from Book 3–well, I thought of Dark Moon as very much Isolde’s book, the whole story is really about her journey of overcoming the trauma of the past and finding lasting healing. In the same way, I think of Book 3 as Trystan’s book, so a good deal of the story is about his journey to make peace with his own past. And of course lots more romance between him and Isolde! What authors have you read recently that you would highly recommend to your readers? For historical fantasy/fiction, I highly recommend Jules Watson and Juliet Marillier. For anyone looking for a laugh-out-loud funny, yet thought provoking and evocative read, I just finished and loved The Opposite of Me by Sarah Pekkanen. And for anyone looking to entertain a 4 year old or a 1 year old, I can highly recommend The Fourteen Bears in Summer and Winter, by Evelyn Scott: sweet, charming story and gorgeous illustrations! “The young former High Queen, Isolde, and her friend and protector, Trystan, are reunited in a new and dangerous quest to keep the usurper, Lord Marche, and his Saxon allies from the throne of Britain. Using Isolde’s cunning wit and talent for healing and Trystan’s strength and bravery, they must act as diplomats, persuading the rulers of the smaller kingdoms, from Ireland to Cornwall, that their allegiance to the High King is needed to keep Britain from a despot’s hands. “She is a healer, a storyteller, and a warrior. When Britain is faced with threats both old and new, the strength of her love may be the kingdom’s downfall … or salvation. Their love has overcome endless obstacles. Never ones to shy away from danger, former High Queen Isolde and Trystan, a mercenary with a lonely and troubled past, have already endured a perilous journey to keep the underhanded Lord Marche from the throne of Britain. But now a new traitor lurks amongst the kings on Britain’s High Council–and just when they’ve realized the depth of their love for each other, a new danger calls Trystan from Isolde’s side to test the strength of their secret marriage vow. Only Isolde knows that she is carrying Trystan’s unborn child. As Britain’s armies prepare for a final battle in which they will either turn back the tide of the invaders or see their kingdom utterly destroyed, Isolde must undertake yet another daring mission–one that will bring her even nearer to a secret that Trystan has kept for seven long years. As the clouds of war gather, Trystan and Isolde must once again fight to protect Britain’s throne. Together, they hold the key that can defeat the Saxon king, Octa of Kent, and Lord Marche. But the cost of Britain’s sovereignty may be their own forbidden love.